RJ's Natural Licorice for sale. Buy online at Zingerman's Mail Order. Gourmet Gifts. Food Gifts. Black licorice from New Zealand. 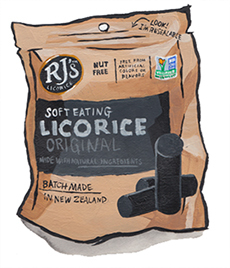 In our continuing campaign to give licorice the respect it deserves, I present RJ’s Natural Soft Chew Licorice bites, New Zealand’s most popular licorice. Usually licorice breeds a love/hate relationship. But this one could be the great ambassador, bridging the gap between licorice fanatics and those almost willing to give it a shot. Family owned and operated, licorice is the sole focus at RJ’s. The licorice they use comes from the roots of the Blue Flowering Snow Pea plant, but it’s the texture that really sets ‘em apart. These soft bites are mouth watering and easy to eat. Throw the toothpicks away: this licorice won’t get stuck in your teeth.